PHOENIX (August 15, 2016)— A new survey of high-efficacy Republican primary voters in Congressional District 5 shows that after significant expenditures, including money from undisclosed donors filtered through the dark money organization “Club For Growth”, the race is now a toss-up with two weeks remaining. The survey, conducted on behalf of Arizona First from August 8-10, shows State Senate President Andy Biggs at 22.0%, attorney Christine Jones at 19.5%, former Maricopa County Supervisor Don Stapley at 16.8 %, and State Representative Justin Olson following behind with 14.0%. More than a quarter of the electorate, 26.0%, remains undecided. Cowley served one term on the elected board of the Maricopa Special Health Care District Board of Directors. During his time on the board, Cowley helped turn around the Maricopa Integrated Health System going from $12 million in debt to $97 million in reserve. Cowley left the Board after serving 4 years as a public servant with no compensation. Neither Arizona First nor the polling firm is professionally or personally supporting any of the candidates for Congressional District 5. During the 2014 elections, more than $15 million in anonymous “dark money” campaign contributions were spent in Arizona to ensure that specific candidates were elected. Arizona Senate President Andy Biggs and House Appropriations Chairman Justin Olson have backed efforts to reduce campaign finance regulations including weakening financial disclosure rules – especially for so-called “social welfare” dark money organizations. One such example is both Biggs and Olson casting votes during the 2016 session in support of Senate Bill 1516 which eliminated any State regulation of these organizations. SB 1516 reduced campaign finance disclosure requirements and turned all enforcement authority over these organizations to the United States Internal Revenue Service. 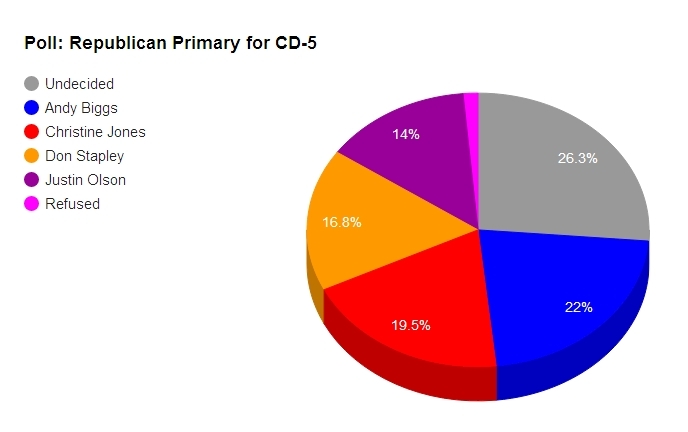 The poll surveyed 400 likely Republican primary voters from August 8-10 and was commissioned by Arizona First, a non-profit group dedicated understanding the Arizona electorate and its views on significant public policy issues. The live interview survey of voters was conducted by HighGround to both landline and cell phone users and balanced across age and regional representation. The margin of error of the survey is ±4.88% with 95% confidence. HighGround recently “nailed” the Prop 123 election results within 0.2% of the outcome prior to the May 2016 election. Other clients and surveys conducted by HighGround include Restoring Arizona, Arizona Board of Regents, Arizona Hospital and Health Care Association, Maricopa Health Foundation, Education Health and Safety Coalition, Build the 202 Coalition, Keep the Cubs, Yes for Mesa, local school districts, and various candidate campaigns. Q. If the Republican primary election to choose a candidate to for the United States House were held today, would you vote for? [Rotate names] Andy Biggs, Christine Jones, Don Stapley, or Justin Olson? Citizen A says that outside election spending needs to be controlled and disclosed. This so called dark money is allowing outside interests and wealthy individuals to control our elections without disclosure. It is wrong and the voters of Arizona deserve to know where this dark money comes from. Citizen B says private individuals and organizations have a right to anonymous free speech and the government should not limit their right to participate in elections. Everyone has a right to participate in the political process and share their ideas free from political retribution. The current system for financial disclosure works well and we should keep it. Please tell me which statement opinion is closer to your own opinion. Be the first to comment on "AFLF POLL: CD-5 Race “Toss Up” after a Monsoon of Dark Money Influences Voter Attitudes"